Hawar Islands is an archipelago of 16 islands, Hawar being the main and largest island reaching up to 52 km2. Located 20kms south of Bahrain, it is a 45 – 60 mins boat ride with our new fleet.  Hawar Beach Hotel, 4 STAR Hotel located at the center of the southern coast of the mother island Hawar (North of 25 ° 39’3 / 06 “, East of 50 ° 44’31 / 926”). Since September 2016 the hotel has been powered by the ‘South Tourism Company’ which is owned by ‘Bahrain Mumtalakat Holding Company’.